Jet Blue - Would Social Media Marketing Have Made A Difference? Robert Scoble - When I say “social media” or “new media” I’m talking about Internet media that has the ability to interact with it in some way. Stowe Boyd, - Social Media = what the edglings use to communicate about how to define social media. Smart people. But all this chatter made my head spin since they were basically saying the same thing. At least I think they were. By the way, my favorite description of social media is one I heard from Mike Murphy, chief revenue officer Facebook. Active Sharing Online. Simple. To the point. Easy to remember. Actively sharing implies conversations which implies building community. Online sharing implies the 2.0++ widgets and gidgets. Perhaps we should add .. "available to anyone with internet access" and be done with it! Girlfriend, I needed more coffee! Armed with the last of my stash of Trader Joe's Christmas Coffee blend I continued the follow-the-link-game which led me to Brian Solis at PR 2.0 who brought the dissuasion to social media and marketing and a side step away from our friends the geeks (all but Marianne who is a savvy marketing diva!). The end line of Brian's post What's Wrong With Social Media? is relevant to marketers. - Social Media has yet to reveal its true impact among those around the would who have yet to embrace it and participate. The way we consume and share information will only continue to change until it completely transforms from one-to-many to many-to-many. And then one more click to BL Ochman's very clever 12 Tenets of Social Media Marketing which proves that marketers do have a sense of humor .. even if a few indulge in a drink or two of the proverbial kool aid! At that moment the news reported the jetBlue was instituting a new concept in airline customer service - a Passenger Customer Bill of Rights. I hoped hopped (thanks to Valeria Maltoni for the catch .. perhaps I was hoping for something innovative!) over to the jetBlue website and found front and center on the home page that David Neelman, CEO of jet Blue is using You Tube to get the message out. From a marketing perspective, jetBlue's use of YouTube, as a distribution channel, is on target. I can't help but wonder if this is the start of a beautiful friendship between jetBlue and social media marketing. Or is it simply part of a crisis management strategy? Will jetBlue join Southwest Airlines as the second commercial airline to be a part of the bigger conversation? Just for fun .. here is the blogophere buzz on jetBlue. Google Blogs shows that in the past week there were 6185 mentions of jetBlue. Technorati shows that jetBlue's buzz went over 500 mentions a day. Posts that contain Jetblue per day for the last 30 days. What's interesting, and may not be a big surprise with jetBlue customers, is that among the justified rants there are a significant number of people who still love jetBlue. jetBlue customer evangelists are ready to kiss and make up. From a marketing perspective, jetBlue has a great opportunity to leverage this positive energy to help with the healing of the runway fiasco. How about a blogger relations program? How about developing a social media community where people can share their passion for cheap travel? How about an easy way to communicate with jetBlue that goes beyond the email form on its website? The sky's the limit jetBlue! So divas and divos of social media marketing or social media or whatever you are calling yourselves these days ..The Question Of The Day: Would a social media marketing strategy have made a difference to the short-term and long-term impact of the brand called jetBlue? As usual you brought the conversation around to a real time example. Jet Blue, apparently without a social media strategy, apparently now has a branding problem and a crisis to manage. So, spoken with a sincere glass of Kool Aid by my side...I think it would have made a huge difference. Just starting at the beginning benefit...they might have been more in touch with their customers and perhaps would have dealt with the incident differently from the onset. Moving on from there, they could have provided their evangelists with some real information as the situation progressed. I too wondered about the disconnect between Jet Blue's public mea culpe and the void ( as of yesterday) to any kind of outreach to their customers. Perhaps if they had a social media strategy they would have put up the You Tube video before they chatted with the NY Times. Without the strategy you had the CEO of Jet Blue saying how humiliated he was but their web site didn't seem to display that feeling. Instead, it was still about making reservations for cheap flights. It will be fascinating to see if Jet Blue can recover from this. It's interesting to see how public relations often does not include a comprehensive, well-thought out crisis communications plan -- and here's the key -- that *matches* the company's culture and brand. At least those that the company wishes to put forth. Social media is just that: a new medium where the dynamics between company and people are different from those with MSM. Maybe more direct, less filtered, researched, etc. As we do by reaching out to MSM professionals, if we're serious about our brand/culture as translated by new/social media, we need to reach out to the influentials in that environment. I think the question is more one of responsiveness in both cases. Remember to respond, promptly, not react (as it seemed in this case). Part of the response *needs* to be what you are doing to make things right by your customers, the people who were affected. Great blog! I guess I'm one of those "customer evangelists," because I have really appreciated the way that JetBlue has handled their PR in this situation. I have a great story about JetBlue that happened to me this week. If you get the chance check out my latest blog entry "Why I Still Like JetBlue." Hey Toby, JetBlue was here for a RAMA event last year. The marketing director. He spoke to a crowd of well over 350... Afterwards, I approached him and suggested that JetBlue would be a perfect candidate for a blog. He pooh-poohed the idea. No time. Nothing to write. Etc. The usual excuses. I wrote to him a couple of times, offering to just chat about it...then dropped the idea. I wonder...if I should have been more persistent. 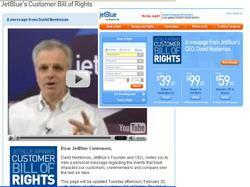 Love the post - one clarification, JetBlue has created a *Customer* Bill of Rights vs. a "Passenger" Bill of Rights. I see a distinction in JetBlue trying to reach out to their customers (people who return again and again) vs. some transient travel creature. Maybe that's just me, but when I wrote my post last night, I drafted it with "Passenger" and changed it at second glance. I'll definitely fly them again. Jetblue's "Bill of Rights" is no more than a PR exercise. It's about as valid as the Taliban Bill of Rights. My 19 year old daughter flew Jetblue from Syracuse to Cancun over Spring Break. They lost her luggage and still haven't found it. She spent countless hours trying to get ANYONE (including David Neeleman)at Jetblue to take any interest at all. No responses to countless voicemails, emails except one which sent her a claim form that will not cover the most likely valuables that would be in checked luggage, eg. jewelry, cameras, electronics, the suitcase itself(!),etc. They will only cover items claimed with ORIGINAL receipts. She has submitted as many as she can, but clearly only a fraction of the contents. We are not holding our breath. Oh, did I mention that she was booked back on a Saturday, but due to a storm at JFK the flight was overbooked. They finally got her out the following Wed. When she asked them to pay for her hotel for those extra 4 days, they said they did not cover "acts of God". Jetblue deserve to go into receivership - they have no clue what they are doing. Please boycott them and save yourself a bunch of headaches. They may be cheap, but they are BAD! other airlines are now paying serious attention to blogs as a part of their customer service remedy of problems or issues. You may find this article interesting.